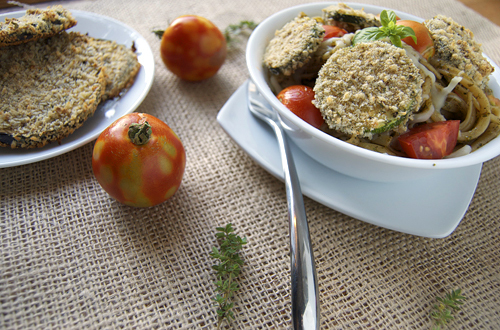 These baked veggies are so delicious, crunchy on the outside and soft on the inside. They make great snacks too, just dip in some ranch! This was my first time making a chive based pesto and I am in LOVE! It is such a great pairing with the basil and creates a delicious tasting pesto. 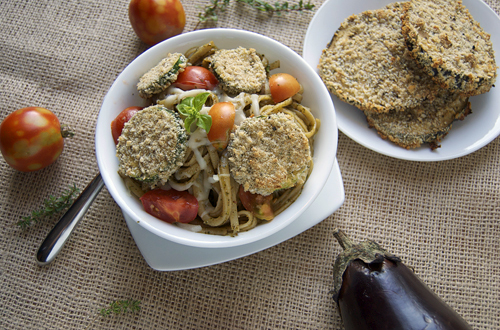 So, if your garden is giving you enormous amounts of zucchinis, eggplants and tomatoes just grab some fresh herbs and you have this delicious, crunchy pasta dish. For the breaded veggies, prepare three bowls, one with flour, one with the beaten eggs, and one with the mixed panko and Italian bread crumbs. One at a time, coat each slice in flower, dip in the egg wash, then coat with bread crumbs. Place each coated veggie on a greased baking sheet. Bake at 375F until crispy and golden brown (about 30 minutes). If they are not crispy after 30 minutes, turn on the broiler for a few minutes to finish. Meanwhile, cook the pasta to desired doneness. For the pesto, combine the chives, basil, garlic, lemon juice, almonds, salt and pepper in a food processor and process until smooth (about 1 minute). Slowly add the olive oil to the mixture while continuing to process. Once a thick pesto is formed, stop adding oil. Toss the pasta with pesto and tomatoes, then top with mozzarella and breaded veggies to serve. That would be nice to walk in the garden and pick what you need for dinner. Another great recipe. Tremendous food photography! This is very much a dish of high caliber ingredients and presentation. Quite admirable! This is such a beautiful dish! It looks amazing! I love that the veggies are baked, but they still look so crispy. I’ve never tried chive pesto, but it sounds delicious! What a lovely meal, I love crumbed eggplant and the pesto sounds great. Loves all the ingredients jenny! Tq for posting the recipe jenny! Ok, this looks so delicious!!! And that pesto sounds fabulous! I’ve tried making it with chives!! Eggplant is all the rage this week. I am seeing it pop up everywhere, even in my own kitchen. But that is not a complaint! Looks great, thanks for sharing a great recipe to use for eggplants… I can’t get enough! I’m so jealous that your zucchini is continuing to do well. Our summer was so hot that all the plants shriveled and died way to earlier. It happened all over. We were robbed. After seeing this gorgeous recipe, we were doubly robbed! I’ll have to actually ::gasp:: go buy some. It looks great. I’m really looking forward to giving this recipe a go. Love the photo under the recipe – lovely! What a delightful picture you painted….going into your garden for dinner….and what a dinner! Delicious! Oh Im so jealous that you have a garden! Eggplant is totally one of my favorites and I love the chive pesto you made.